The Kite Aerial Photography community is one of those groups where the members are sort of eclectic, and get tons of enjoyment from capturing unique aerial imagery by hanging a camera from a kite. Anyone who has tried KAP gets not only the satisfaction of flying kites, but the reward of seeing a bird's eye view in the images. I was hooked from the first session, and have been flying cameras on a string ever since. You've decided that you want to be part of "that" group, and want more information on ways to get started. As a KAP nerd, I think I speak for the entire group by saying, "Welcome!" People have been using Kites to capture aerial photography for over a hundred years. George R. Lawrence made a name for himself using a series of kites to lift a 50 pound camera in 1906 to document post-earth quake San Francisco. Most modern day kite photographers use a suspension rig which was designed by Pierre Picavet way back in 1912. What has changed is the quality of the cameras, the design of the rigs, and even instant gratification in seeing the images through wireless networks. I will focus on the actual rig that holds the camera in this thread, and show how you can create your own. 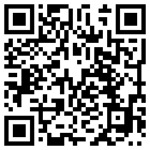 I'd also like to suggest that you check out the Kite Aerial Photography forum. There are hundreds of photographers that discuss everything KAP, and should be your primary resource when you start your journey towards kite photography. Before you even think about launching a KAP rig, please keep in mind that hanging a camera from a kite string can be dangerous. If the kite fails or the camera falls from the rig, you could potentially cause serious damage to your camera, and injury or death to anything underneath. I would recommend that you never fly your rig over the top of people, and ensure that there is a safe zone in case of failure. What sort of Kite do I need? I have 4 kites that I use in my KAP quiver. 3 of them are soft kites called FlowForms that do not have any struts or a rigid frame. Unfortunately, they do not make the original Flowforms anymore, but there are similar alternatives. The nice thing about these kites is that they are very stable in the sky, which is critical for capturing great imagery. The less the kite moves around, the less the camera will move around as well. Many fly a Delta kite, which comes in many sizes. Hopefully it's obvious, the more wind the smaller the kite you need and vice versa. I once told a worrisome friend of mine when he watched me hang a camera over the water from a kite, "There is always risk in being awesome." Just understand that with the risk of launching a camera hundreds of feet in the air, there is a chance that you may lose or break it. So, don't send your shiny new dSLR camera up when you don't know what you're doing. There are plenty of low cost solutions that will get you amazing results while you learn the ropes. That being said, you need a camera that has the capability to take pictures automatically. This is called an intervelometer. Some cameras have it built in, some use external triggers, and some can be hacked with custom firmware to accomplish this. I'm not going to go into a lot of detail on what camera to use. For this thread, I'm using a GoPro HD Hero 3, which has a built in intervelometer. It's light, wide angle, and easy to use. My first camera used in KAP back in 2009 was a Canon SD900 running the CHDK hack. Since then, I have used 7 different cameras. There are many options. Do I need to build my own suspension rig? Not really. 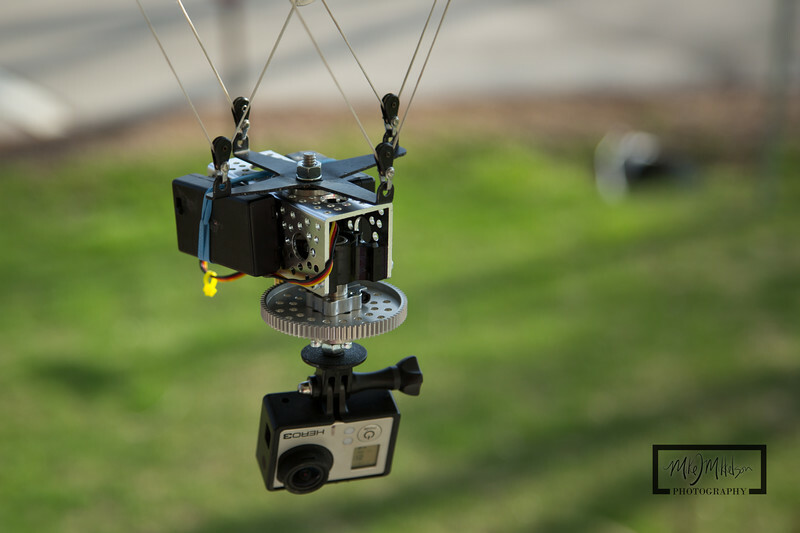 You can buy Kite Aerial Photography rigs that are ready to go. I suggest browsing the options at www.brooxes.com. I think that one of the most enjoyable parts of the hobby is building your own rig. I've created many different rigs from static to full remote control. At this point, I fly 95% of the time with an Auto-KAP rig. It's simple, and I still get the shots I'm looking for. Auto-KAP basically takes and rotates the camera while it's in the air. You can also add tilt to the mix. 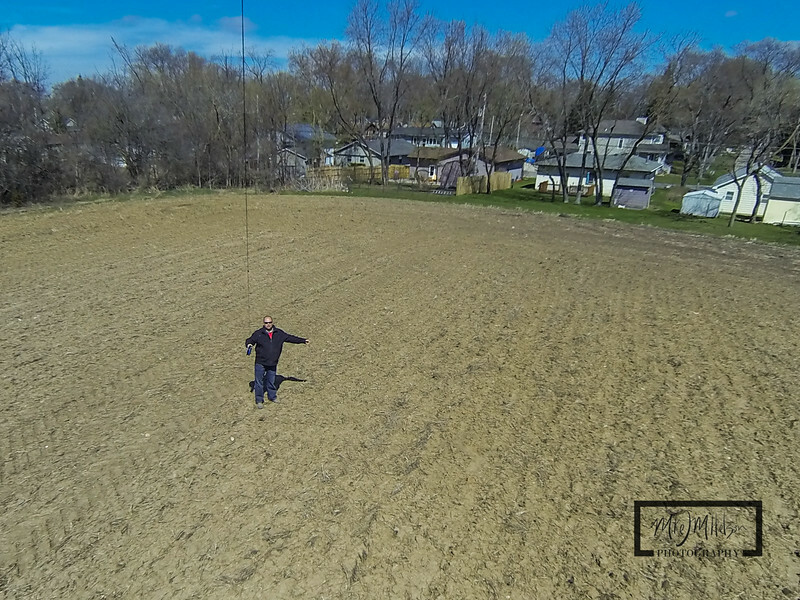 Since Kite Aerial Photography is many times a solo activity, I find that Auto-KAP is the simplest way to get the most out of your session. For this article, I've built a panning rig using Actobotics parts from ServoCity.com. I've used a channel mount servo gearbox and hub gear reduction to slow down the rotation, so that the camera has time to take pictures for a number of seconds before rotating to the next stop. I've also added the AuRiCo, Automatic Rig Controller, which operates the continuous rotation panning servo. I've set it up to rotate a small amount, and then wait a few seconds before moving again. This really works great on a rig that has Pan and Tilt. The picavet suspension, which helps keep the camera level to the horizon, uses aluminum beams with eye hooks on the end. Normally, I use PeKaBe ball-bearing blocks, which are smaller precision pulleys that really give the smoothest possible picavet. However, in order to keep the cost of the rig down, eye hooks work just fine. Here is the rig without the aluminum beams, and a compact picavet package from Brooxes.com. With the rig ready, now you're set to go and fly your kite. 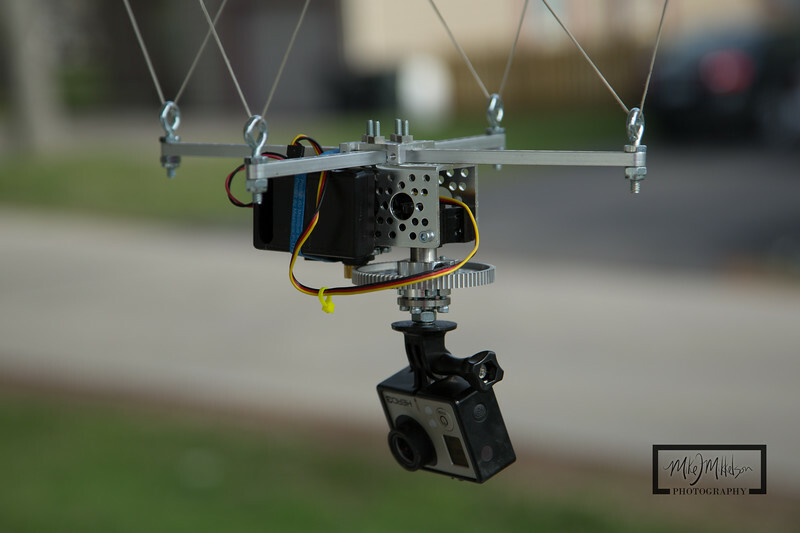 The camera suspension rig is not attached directly to the kite. It's attached to the kite line about 100 feet below the kite itself. This helps with stability. The Actobotics rig above rotates 360 once every 8 minutes or so. Unlike Ellen's selfie, this one isn't going to set any Twitter record. However, one of the outcomes of using auto-KAP is the aerial self portrait. The Actobotics rig worked well, and I was able to keep the kite aloft for about 45 minutes. 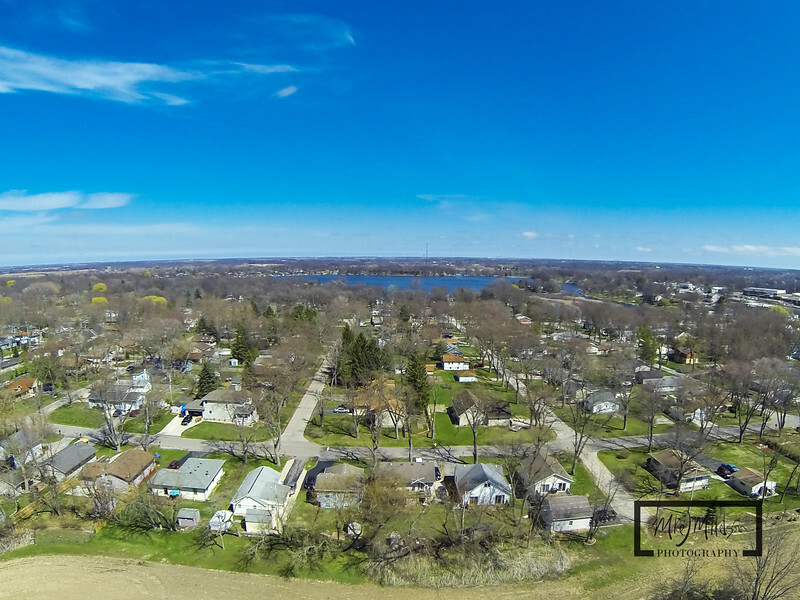 The result is an aerial view of my current home town, Paddock Lake, Wisconsin. My house is even in the shot as an added bonus. No leaves on the trees yet, as spring finally arrived a few weeks ago. The internet has a wealth of information on Kite Aerial Photography, so do your research before making any design decisions. I find it very enjoyable to build your own rig and play with different configurations. 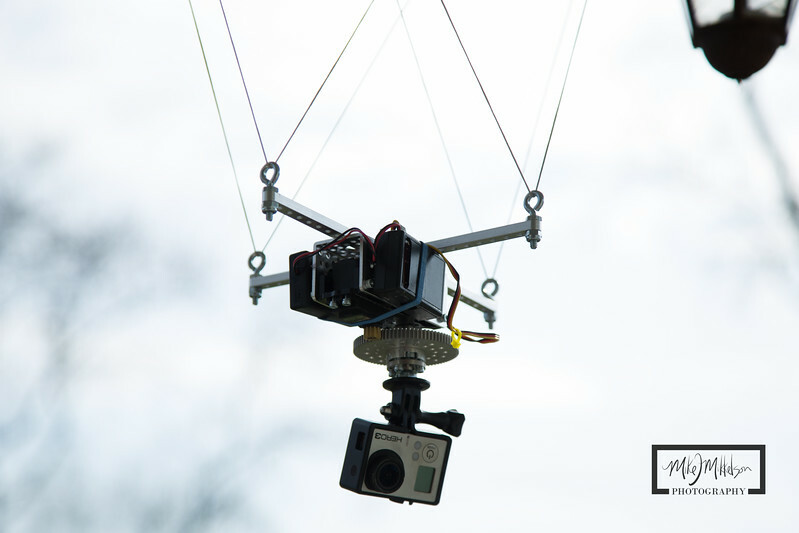 Having a simple, auto-rotating platform for your camera will make Kite Aerial Photography easier and more enjoyable. Fly safe! I've had a few opportunities to test the eMotimo TB3, as I want to ensure that when I really need to set up a time lapse sequence, that I know what I'm doing. 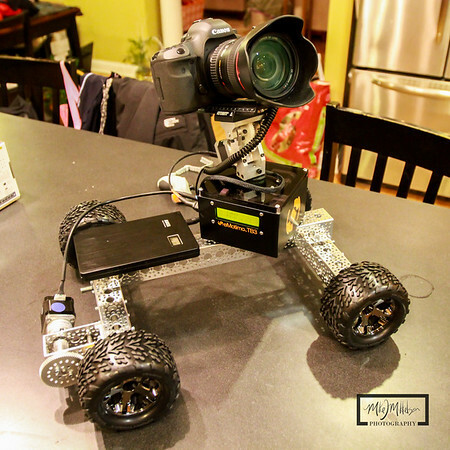 The TB3 makes it really simple, as I've used it on a tripod, on a slider, and my DIY time lapse rover. Below you will see some preliminary examples of me setting up the TB3 for time lapse sequences. Time Lapse Rover testing at the Milwaukee Art Museum. The rover traveled over 90 feet on this sequence. The goal was to have the rover hit the mid-point when the Milwaukee Art Museum's wings on the Quadracci Pavilion opened up. Unfortunately, the winds were too high for the Burke Brise Soleil to open. Since there weren't many clouds, and the signature wings did not open, this time lapse is a bit boring. However, it was still good practice and I let the rover span the almost 100' arc in just over 2 hours. What I did discover is that even though the rover is low to the ground, it doesn't escape movement caused by the wind. Being virtually next to Lake Michigan, the winds were above the 23 mph threshold for the wings to open, and caused some shake to the camera on the rover. I'm definitely going to attempt this sequence again, hopefully with better conditions. The wings open at 10:00am, close and open again at 12:00pm, and then close at 5:00pm. I also put a GoPro on the front of the rover to capture the arc across the cement in front of the museum. Not too exciting, but definitely shows when the rover in motion, and this camera isn't even linked to the TB3. One other interesting tidbit is that many people stop to ask about the rover. I politely try to explain what I'm doing, and people smile bewildered. You'd think that with the sound of the shutter, and a camera mounted to the rover it might be common sense for people to not stand right in front of it. Apparently not. One person even made the comment, "That is the coolest photography accessory I've ever seen!" I know, the rover is kind of a big deal! The motor on my custom DIY eMotimo TB3 time lapse rover was replaced with a 14:1 stepper that has a good combination of torque and speed. (Speed relative to the original 27:1 motor) I did some testing over the weekend and headed down to Lake Geneva. This series stretched 30 feet with 845 images over 70 minutes. Outside building a ridiculously long slider, this type of time lapse wouldn't have been possible without the DIY Rover. I have some ideas to try a time lapse sequence where the rover travels over 100 feet! I did try another sequence at the Yerkes Observatory in Williams Bay, Wisconsin. Unfortunately, the path I had to work with wasn't exactly straight. The problem with the rover as it's currently designed is the inability to steer the rover while it's in motion. I'm able to make manual changes to its direction, for example, like when it gets too close to the grass on the sidewalk. However, this changes the angle of the camera along the way. Ideally, the Rover would be set correctly before starting, with not adjustments needed. Here is the first half of the sequence. The full sequence, the rover drives over 80 feet in about 2.5 hours. I also attached a GoPro HD Hero 3 to the front of the rover during this sequence, and set the camera to capture every 10 seconds. You can definitely see when the rover's direction is altered, as the GoPro is mounted to the front axle. Interesting perspective, without needing a dSLR. I certainly get better image quality out of my Canon, but the GoPro is a great addition. What I learned from this session is that I need to be very precise in setting the angle of the rover axle, or I need to find locations where I'm not limited to a 4 foot sidewalk. Finally got to try the eMotimo TB3 on a large and fun subject: The Las Vegas strip! Using Panoramic mode, I used a 400mm lens to capture roughly 370 images to create this gigapixel panoramic. Go ahead, Zoom in! 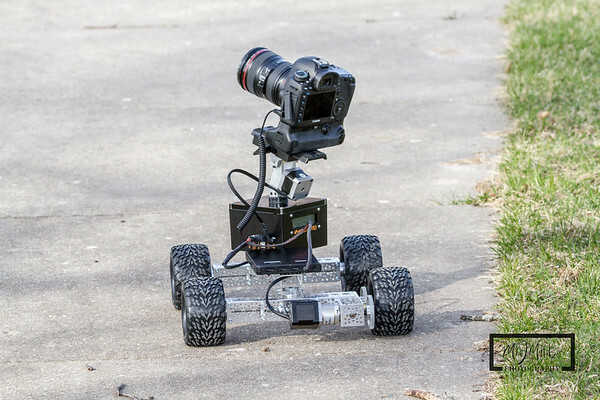 Testing the eMotimo Rover: First Run. Spring seems to finally be here. I needed to spend some much needed time cleaning up the garage, so I decided to put the new DIY time lapse rover to the test and let it run while I was busy doing other things. I really wanted to test this thing outside, and snow sort of put a damper on that until recently. The amazing thing about this custom rover, is that you're not limited to short distances like you would be with a slider. This test footage was captured over about a 30 foot stretch of sidewalk for 1.5 hours taking a picture every 8 seconds. The destination is outside my house, and not very exciting, but keep in mind that this is a only a test. The great thing about the eMotimo TB3 is that you just drive the rover from the start point to the end point, and it does all the calculations for you. You set the ramp up time, number of exposures, interval, etc. The bad thing is that I currently have the slower (27:1) stepper motor on the rover. Since you have to drive the rover from the start to finish, and then it has to drive it back to the start point, it takes a bit of time to get set up for a long distance time lapse. eMotimo only offers 2 options for 3rd-axis stepper motors on their website, the (5:1) for faster moves needed for video and the (27:1) which offers more torque but slower speeds for time lapse. Unlike my Dynamic Perception slider dolly with quick release mount, it takes a bit of time to get the motor mounted to the rover. So, I've ordered and installed a permanent (14:1) stepper motor specifically for the rover, and hopefully, it will have a good combination of speed and torque and I'll never have to take it off. Special thanks to Gunther at LRTimelapse for posting the proper wiring instructions. This initial test, I set up the rover to go in pretty much a straight line down the sidewalk. Since the sidewalk wasn't completely level, the rover did drift a bit. I look forward to setting up a time lapse using a circle or arc, which wouldn't be possible with a slider. I used Actobotics parts from ServoCity to build the rover, and it allows me to set the angle of the front tires. Each time there is a break in the sidewalk, the rover dips when each of the wheels traverses the crack, causing a bump in the video footage. I'll need to keep this in mind when finding suitable locations for the rover, and try and get as smooth of a surface as possible. I'm not sure if there is a limitation to the distance the eMotimo can handle, but I plan on creating something this summer that is at least a couple hundred feet. Headed to Las Vegas for a business trip this week. Just need to decide whether to bring the rover to capture a time lapse of the Vegas lights, or stop by the NAB show!